Queens Park Rangers' new manager Iain Dowie says he knows he has to get the club back in the Premier League in the next two years. He told BBC London 94.9: "My contract's two years so I hope it's realistic. "We're going to be a very competitive team and I think within two years I'll have to bring success to this club. "I want to make sure people at QPR think of me as a manager who knows how to get the job done and also brings attractive football to the club." Dowie will be under pressure from owners Flavio Briatore and Bernie Ecclestone who stated the importance of QPR returning to the Premier League within the next three years when they took charge in September. The former Rangers player said: "This job is about pressure, if you buckle under it, don't take the job, so I'll have to embrace that pressure. "It would be foolish of me to say this is not a job that brings it's own pressure with it, this is a pressurised job, staying in the division." 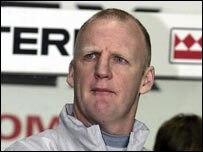 Dowie, who was sacked as Coventry boss in February, says he is thrilled to be involved at Loftus Road. "My first thoughts of being manager at the club with the richest owners in the world is 'wonderful', it's better to be that, than at the poorest." He added: "I'm delighted to be back, it's a great club historically, I think in terms of fan base and tradition it's a proper football club and these are exciting times." Dowie is already looking ahead to the start of the season and knows what he will be looking for in the squad. "We'll try and get good young players in here, we'll try, if we need to, get good established players at the club too and hungry players, that's the key element."